Home › Alternative/Complementary Medicine › The Irish Times: Promoting homeopathy, endangering children? The Irish Times: Promoting homeopathy, endangering children? The Irish Times is the so-called “newspaper of record” in Ireland. It has a reputation for being Ireland’s leading print source of intellectual commentary and political analysis. It is widely regarded as maintaining impeccable journalistic standards and of being one of Europe’s leading newspapers. However, when it comes to alternative medicine, and homeopathy in particular, it has something of a weakness. Like many newspapers, the Irish Times appears to judge homeopathy as being immune from the normal standards of journalistic criticism (or, perhaps more likely, of being insufficiently important to warrant such rigour). This can almost be excused on the basis that any reader who is so ill-informed as to take the claims of homeopathy seriously should be willing to take responsibility for the outcome of such bogus treatments. However, when these readers are parents of vulnerable children, and when the Irish Times recommends that (inert) homeopathic treatments should be offered to children ahead of (effective) pharmacological ones, then we have a serious problem. 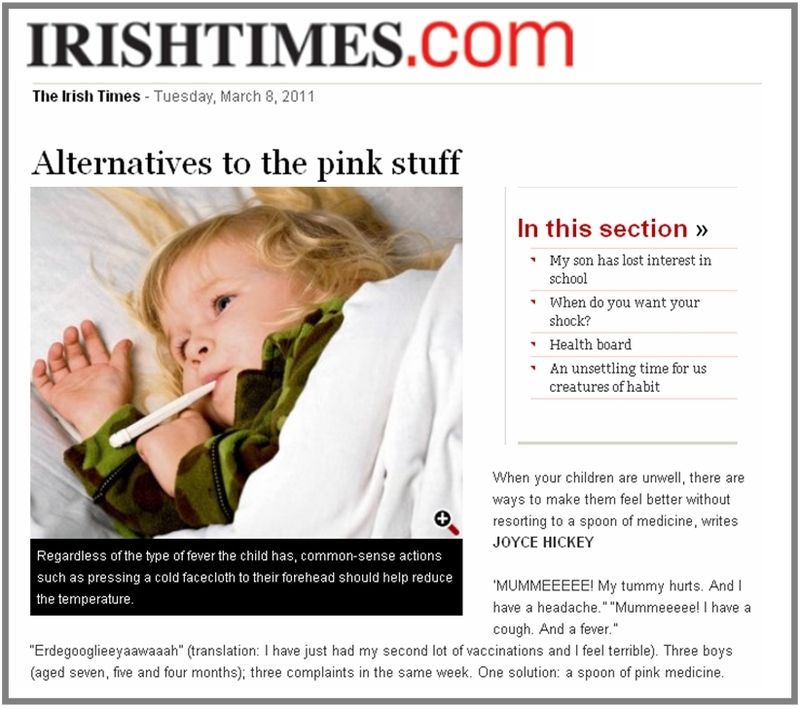 Yesterday’s Irish Times article, “Alternatives to the pink stuff” (an allusion to Calpol, a popular — and pink — paracetamol-based medicine for children), describes the advice of one Lee Ni Chinneide, a homeopath practising in Dublin. One message in the article is that parents should be discouraged from treating child illnesses with “the pink stuff”. On its own, this might be defensible advice. After all, not every minor illness will require treatment of any kind. However, the primary message in the article is more worrying: that, rather than medicines like Calpol, parents should instead use one of a number of homeopathic products when responding to their children’s symptoms. Given the highly controversial nature of homeopathy, there is a clear recklessness involved in this advice. Essentially, the Irish Times is encouraging parents who have sick children to avoid treatments that have been demonstrated to be effective and instead to administer treatments that have been proven to be useless. Put more simply, the Irish Times is suggesting that we give pretend medicine to our children. If all parents were to follow this advice, it would be only a matter of time before some seriously ill child develops significant complications (and perhaps even dies) as a result of not receiving appropriate medical attention and/or treatment. Let’s consider the nature of some of the homeopathic products recommended. Belladonna is proposed as a treatment for fever; it is produced from the deadly nightshade mushroom (which is highly toxic), which is more usually used in the manufacture of poisons. Pulsatilla is recommended for a “weepy” child; this is a highly toxic flower that has been used for centuries to induce abortions. Aconite, proposed as a treatment for shock, is yet another highly poisonous plant, which was used superstitiously in medieval times to, erm, ward off werewolves. So the bad news is that each of these substances is highly poisonous. Of course, the good news is that, in reality, homeopathic remedies do not actually contain such ingredients at all. The claim that these ingredients actually exist inside a homeopathic pill is just plainly inaccurate (and is arguably deliberately so). It is well documented that homeopathy rests on alleged biochemical processes that are just physically impossible (see here and here). Similarly, the notion that homeopathic treatment in any way produces medicinal benefits for patients (ones that are not explicable as placebo effects or as illusions caused by the distortions of anecdotal reports) is just as widely reported (see here and here). However, one additional homeopathic delusion, which receives less attention, is very nicely illustrated in the Irish Times article. This is the idea that homeopaths provide individualized treatments, which is just another myth. The existence of this myth creates a huge contradiction at the heart of the homeopathic spiel, vividly displayed in the Irish Times article. It relates to what the journalist describes as the “homeopathic” principle of “treating the whole person, not just the symptoms”. As is virtually always the case when journalists write about complementary therapies, we are informed that homeopaths use “individualised” treatment methods, that they engage in “listening” to patients, and that they seek to “tailor treatment” to the each particular patient. In other words, it is alleged that homeopaths will spend time getting to know you as a unique individual, and will design a special treatment just for you and your uniqueness. This is an almost universal claim that appears right across the spectrum of complementary and alternative therapies. The intention behind it is to imply a contrast with mainstream medicine, which is accused of adopting the exact opposite posture (i.e., of not listening to patients and of instead treating patients with a one-size-fits-all approach). However, as the rest of the Irish Times article shows us, this notion is all but bunkum: homeopaths do not do offer individualized treatment at all. Rather, homeopaths recommend generic remedies to treat generic symptoms. Instead of being individually tailored to the needs of individual patients, these treatments are recommended on the basis that patients meet simplistic diagnostic criteria. Forget all that stuff about listening to people’s individual predicaments and experiences, it all comes down to a simple formula of “if the patient has X, then treat them with Y”. For example, in this case we are told that if a child has a head fever, then treat them with belladonna; if a child has a snotty nose and sweats in bed, then treat them with pulsatilla; if a child has experienced a shock or a fright, then treat them with aconite. This is what homeopathy is all about. Homeopathy does not offer individualized treatment; it offers treatment-by-checklist. The entire ritual of homeopathic practice is founded on a diagnosis-by-numbers approach. Instead of listening to your unique story, your homeopath will compare your symptoms against a list of symptoms that are already documented as having been reported by other people in order to come up with a recommendation. While there are a couple of versions, you can consult the list online (for example, here and here). There is nothing individualized about it, unless you feel that having somebody tick an item on a checklist truly captures your phenomenological uniqueness and achieves the ideal of “individualized” treatment. It is also worth noting that the homeopathic claim about mainstream medicine employing a generic approach is actually quite fallacious. Mainstream medicine offers a genuine form of individualized treatment. Mainstream doctors may not have excellent bedside manners, and they may not be genuinely interested in your life story. But part of what makes the average consultation feel staged and mechanical is the very fact that your doctor is going into pedantic detail in attempting to piece together a picture of your particular pattern of symptoms. Moreover, a mainstream medical consultation is genuinely holistic: it seeks to combine a variety of (scientific) perspectives on how your body works in order to arrive at an understanding of what’s going on and, importantly, to produce a treatment recommendation. Homeopathy, on the other hand, is extremely superficial: all it involves is looking your symptoms up on a (very long) list. There is no science; there is no analysis; there is no reflection at all. It’s a brain-dead approach. For those interested, that pretty much constitutes the legal definition of child neglect. I wrote to complain to the Irish Times about that article yesterday. They didn’t reply. Probably because they’re mincing ballbags. Totally agree – it’s dangerous nonsense and very irresponsible “journalism”. Children have died and parents jailed for choosing homeopathy over proper medicine – http://www.guardian.co.uk/world/2009/sep/28/homeopathy-baby-death-couple-jailed – publishing that kind of crap makes it more likely it could happen here. This is a difficult message to get across to the public. To criticise the promotion of alt. med. seems like an intolerant attack on an alternative opinion. People have the habit of trusting what they read in print, of believing anecdotes and uncritically accepting whatever health claims are made on behalf of often untested and totally unproven interventions. It is an understandable habit but ultimately may prove costly to either their wallet or their health. Great post, Brian. The Independent, not to be outdone in the woo stakes, have offered ‘Acupuncture ‘relieves hot flushes’ as a headline today. So they’ve got numbers and ‘units.’ You simply can’t depend on the mass media to report on science and medicine. It doesn’t seem like they’re making any effort towards honest reporting. just read this.belladonna is not a mushroom but rather a herbaceous plant of the solanaceae family,much like the humble spud. Hi. I uncovered ones blog page making use of yahoo. Which is a really smartly written content. I am certain to search for it and return to go through more within your valuable facts. Just publish. I am going to absolutely gain. Years later. I think you are missing the point of homeopathy. A proper homeopath will always refer to school medicine. Plus the fact that you are not understanding the principles of homeopathy. You should have done better research.